Please find below a selection of books we feel may provide you with ideas to take your business forward. Please don’t hesitate to contact Simon Chaplin if you have any comments on the books (you could prepare your own review) or have problems obtaining copies. The links will take you directly the correct Amazon page. 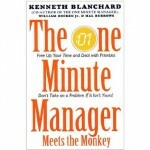 If you don’t have time to read all the books, we suggest you start with ‘The One Minute Manager Meets the Monkey’. 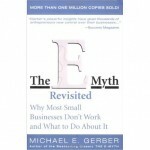 Michael Gerber’s The E-Myth Revisited should be required reading for anyone thinking about starting a business or for those who have already taken that fateful step. 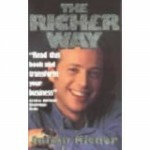 The title refers to the author’s belief that entrepreneurs-typically brimming with good but distracting ideas-make poor business people. Ken Blanchard, Hal Burrows and the late William Oncken define the problem of picking up other peoples Monkeys. The little problems that effectively stop you from performing at your optimum efficency. 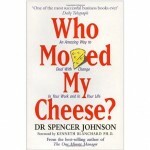 ‘Who Moved My Cheese?’ is a fantastic little book to help you deal with changes in both the work environment and in life. The book’s set in a maze that represents where you spend time looking for what you want. This can be the organisation you work in, the community in which you live or the relationships that you have. In this case, cheese is the success you want in life, whether it’s a job, a relationship or money. The story is told as a parable through the eyes of Haw, a little person, and he explains how the attitudes of Hem, Sniff and Scurry effect their successes and failures. How do you stop your company becoming a toxic energy dump? Why not draw inspiration from Seattle’s world famous Pike Place Fish Market! That’s what Mary Ramirez, the main character from Fish (the latest addition to Greenstone’s recommended reading list) did. Mary, a successful manager in one of the city’s largest financial companies, is asked to turn around a data processing department. The company decided to become “World Famous”. The fishmongers also came up with four basic principles to improve their work lives and, as a result, productivity: Choose your attitude – how do you feel when you arrive at work? Play – have fun doing your job. 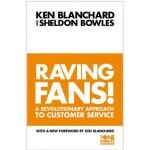 Make their day – customers, colleagues, managers or anyone else you come into contact with. 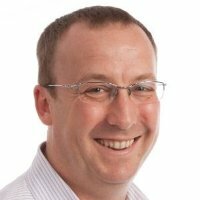 Be present – always look for what needs to be done If you want to change the way your organisation works, you may need a spark. 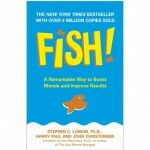 Fish, by Stephen C. Ludin, Ph.D, Harry Paul and John Christensen, may provide that spark. (Review by David Swann).